Are you interested in the study abroad programs but its information is unclear? 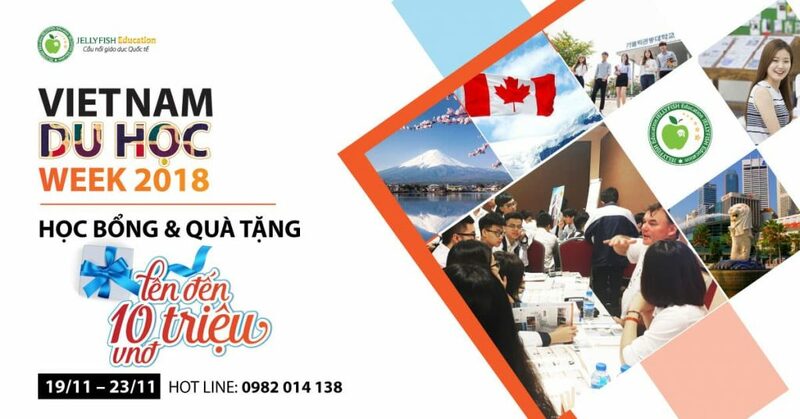 Exclusively in this month, the students who participate in “VIETNAM DU HOC WEEK 2018” will get the answer to the problems of studying abroad and receive special gifts with Jellyfish Education. What is included in “VIETNAM DU HOC WEEK 2018”? ✪ What are the requirements for studying in Japan? How much does it cost? ✪ What are the latest changes to the application process for studying in Korea? ✪ What are the opportunities to study and live in Canada? ✪ How to raise your income with the Earn-Internship Program in Singapore? How to participate in consultancy week – “VIETNAM DU HOC WEEK 2018”? ► You can go to the Jellyfish Education offices in 5 provinces and cities in Vietnam to receive information consulting. Therefore, you will have the opportunity to get all the gifts of value. Head Office: Room 1309, CMC Building, 11 Duy Tan Street, Cau Giay, Hanoi. Ho Chi Minh branch: 4th floor, MB Bank Building, 538 Cach Mang Thang Tam Street , Ward 11, District 3, Ho Chi Minh City.